Sometimes, historical projects get personal. I am a historian at the Rochester Institute of Technology in Rochester, New York. I teach, among other things, the history of baseball and have a long-standing interest in sports history. I could say that my current project is a sports history, and that would be true, but it is also a family history. When I was a girl, growing up in southeastern Connecticut, my paternal grandfather, Danny Rourke, was famous. He played both semi-professional basketball and semi-professional baseball in the state, from 1935-1955. In this way, he was like so many other men in Connecticut in those years, as I have been discovering in the course of my research for a book on this lost sporting world of eastern Connecticut. In this way, my work seeks to recover the hidden history of these local professionals. These independent teams that my grandfather played on no longer exist, teams like Pep’s Flashes, the Shymas, and the Danielson Elks. And yet these were teams that attracted hundreds of fans, garnered lots of local press coverage, and brought their players lasting fame. And sometimes, though comparatively rarely, they produced a professional athlete from their ranks. My research brought me into contact with what one might call the pre-history of one of those athletes. He is pictured in the photograph, from the Norwich Bulletin of 31 March 1941, below. He really is famous. Find him yet? He is a very young Walt Dropo, then in his senior year of high school. He is in the back row, all the way to the right. Dropo was the youngest member of Pep’s Flashes, pictured here after winning the Norwich Bulletin-Record basketball tournament. 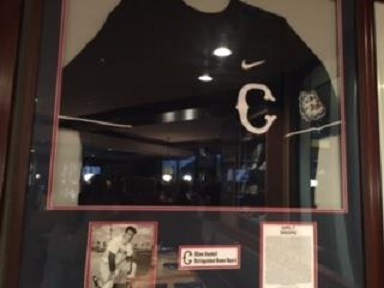 ‘Boots’ Dropo, as he was then known, would go on from Plainfield High School to attend the University of Connecticut, as probably everyone already knows. Upon Dropo’s death in 2010, Coach Dee Rowe called him “the greatest all-around athlete this school has ever seen.” Dropo played football, basketball, and baseball for the Huskies. He was drafted by the Chicago Bears in the 9th round of the 1946 NFL draft. He was drafted in the first round of the 1947 BAA (Basketball Association of America, a pro-league pre-NBA) draft by the Providence Steamrollers. But he turned it all down to sign with the Red Sox organization in 1947. In 1950, Walt Dropo was the American League Rookie of the Year, the first Red Sox to be named Rookie of the Year. He finished sixth in the AL MVP race. His .583 slugging percentage that year was second only to Joe DiMaggio (.585). “New England was full of Walt Dropos then,” Bill Reynolds writes, “small town kids who stole the hearts of their communities because of the way they played this New Game.”(iv) But that was still ahead of him. As late as 1946, you could have seen Walt Dropo playing basketball in a 200 seat auditorium in southeastern Connecticut with my grandfather. By then they were both playing for the Shymas, who would also win the Norwich Bulletin-Record title. Dropo is seen here, in the semi-finals of the tournament. Dropo left for the Red Sox farm system the following year, in 1947. But he left having already played for two different championship basketball teams in Connecticut. As we remember his sports history today, we largely assume it starts with the Red Sox. His time in college sports is seen as a prelude to his professional career. My work allows me to see that he brought a champion’s play to UConn with him. He had been playing alongside semi-pro athletes since he was in high school. That was the drive he brought with him to Storrs. The distance between the professional world of sports that Dropo would enter and the semi-professional levels of sport he was leaving behind was not very wide. Professionals were a part of their local communities then and semi-professionals were treated with much the same reverence and respect. October 14, 1950, was Walt Dropo Day in his hometown of Moosup, Connecticut. Dropo came into town with a barnstorming baseball team, the Birdie Tebbett’s All-Stars. George ‘Birdie’ Tebbett’s was a catcher with the Red Sox. Also barnstorming with Tebbett’s team that fall were Phil Rizzuto and Johnny Pesky. They faced a home team, put together for the occasion, called the Connecticut All-Stars. Walt’s brother, Milt Dropo, himself a star athlete at the University of Connecticut, managed the All-Stars. Playing for them in right field was Danny Rourke. He was at that point playing for the New London Raiders in the Class B Colonial League, an effort to revive minor league baseball in southern New England. The original Colonial League had folded in 1915. This Colonial League was formed for the 1947 season; its last season was 1950. Walt Dropo Day was the last time that Dropo and Rourke took a field together. I was worried for nothing. As I settled into the Nathan Hale Hotel, I stopped at their pub for a beer, after a long day in the archives. I glanced over my head and found that I had taken a seat under Walt Dropo. ‘Boots’ Dropo. Still here, after all these years. i Forrest C. Allen, Better Basketball: Technique, Tactics, and Tales (New York: McGraw-Hill, 1937), 7. ‘Phog’ Allen coached at Kansas from 1919-1956. He coached the Jayhawks to victory in the NCAA tourney in 1952, the same year that he coached the Olympic basketball team to a gold medal at the Helsinki games. He was inducted into the Basketball Hall of Fame in 1959.
iii All coverage from “Third Annual Bulletin Record Tourney.” Undated clipping. Potts family scrapbook. 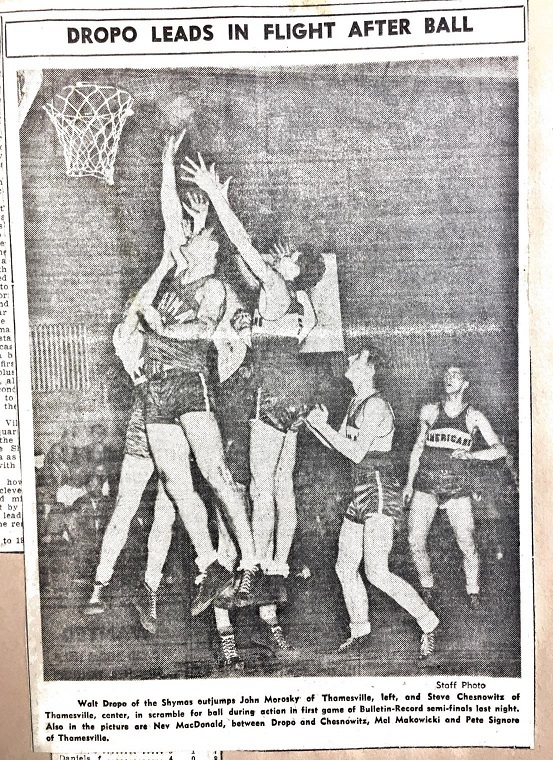 iv Reynolds, Our Game, 7.
v “Shymas Take Bulletin-Record Tourney With 65-49 Win,” Norwich Record (March 31, 1946), 13. From Rourke family scrapbook. 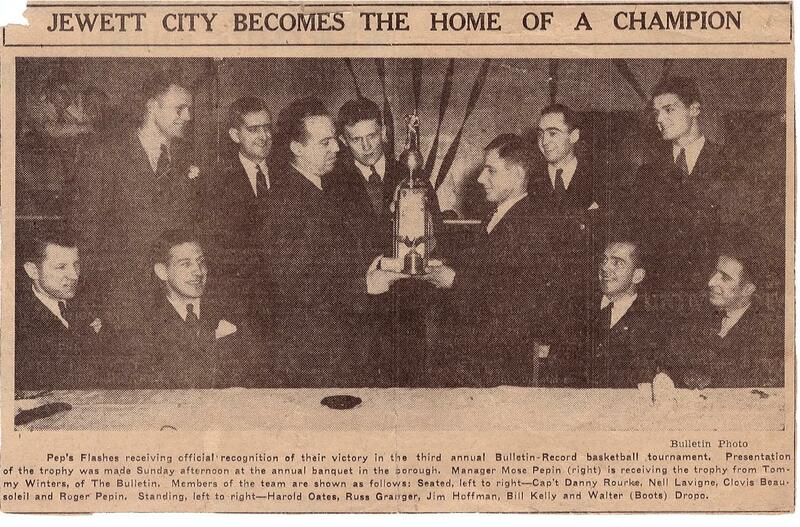 vi “Bulletin Record Tournament Won By Shyma Club.” Undated press clipping. Rourke family scrapbook. This entry was posted in Archives & Special Collections, Archives in Action, From the Researcher’s Perspective…, University of Connecticut, What's Happening in the Archives and tagged Walt Dropo by Melissa Watterworth Batt. Bookmark the permalink.